Sports Minister Shamfa Cudjoe, left, presents a cheque to Special Olympics TT national director Ferdinand Bibby, as Patrice Charles, the sports ministry's director of physical education and sport looks on. TT will be represented by 44 athletes at the Special Olympics World Games scheduled for March 8-22 in Abu Dhabi. This country’s participation was made possible in great part due to the contribution of Government, through the Ministry of Sport and Youth Affairs which provided Special Olympics TT (SOTT) with 100 per cent of the financial assistance requested. 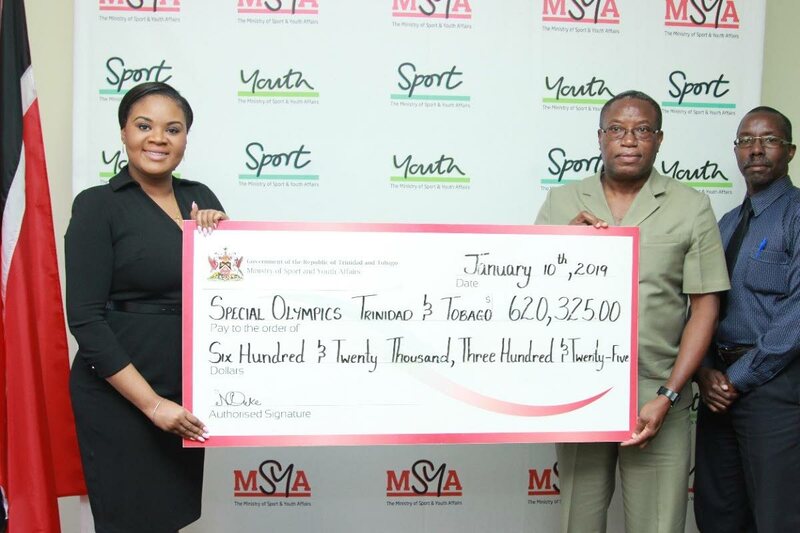 In presenting the $620,325 cheque to SOTT, Sports Minister Shamfa Cudjoe, said she is looking forward to seeing TT’s athletes, who have been training over the last two years, compete against their counterparts from the other 170 nations. She urged the SOTT to ensure that this opportunity is a fulfilling one as it will facilitate opportunities for further development of athletes and promote a culture of inclusion, understanding and respect in sport. Cudjoe also commended SOTT for its persistence to mobilize a team of athletes to participate in the Games. She also lauded the organisation for its various fund-raising initiatives over the last two years. Reply to "Special Olympics athletes get Govt funding"